When Royal Mail issued its London Underground stamps earlier this month, I thought it might be a good idea to see how other similar underground systems had been philatelically represented. 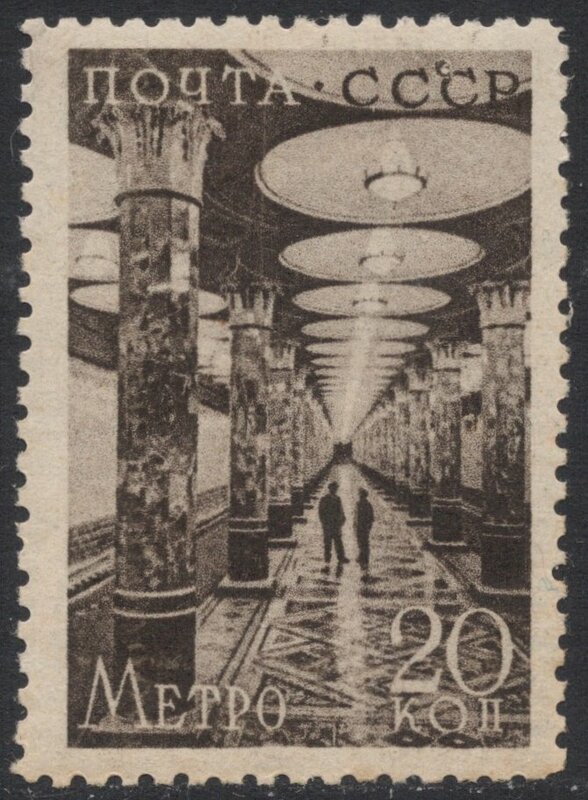 So I went onto eBay, expecting to be overwhelmed with Parisian metro stamps, depicting their beautiful art nouveau entrances. 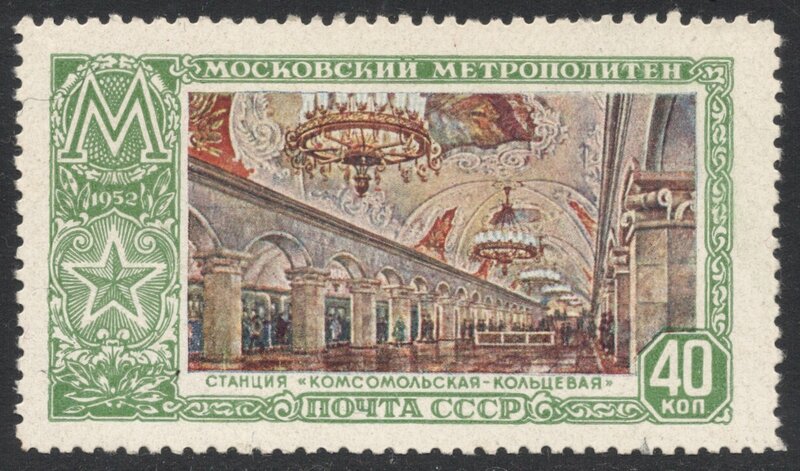 To my surprise, however, there was none of that, and instead I found heaps and heaps of Russian metro stamps! 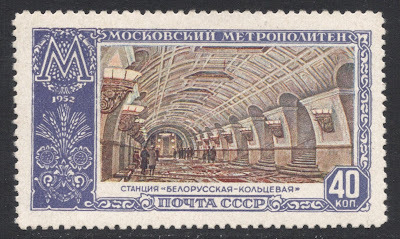 The Russian metro in Moscow was built in 1935, as a gift from the communist authorities to the proletarians. 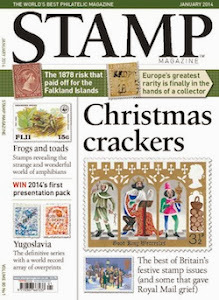 The opening was marked with a commemorative stamp set of four values, which now commands a high price. 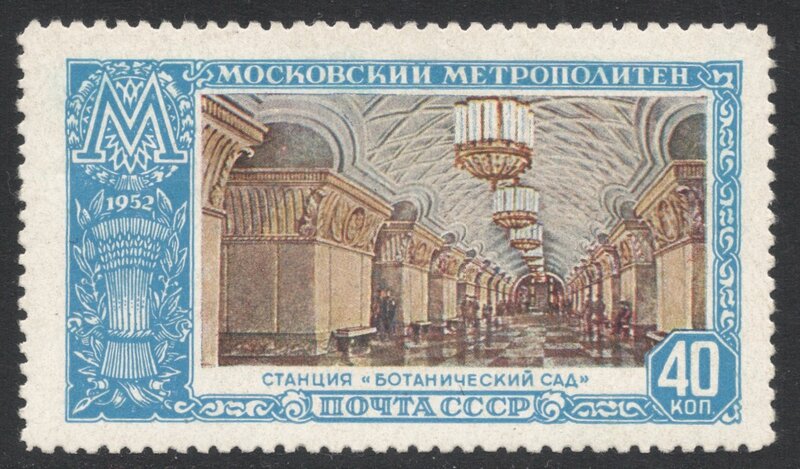 It had taken some four years to build the first bit, a single line, from Okhotny Ryad to Smolenskaya. The Soviet painter Eugene Lanceray captured the excavation of the Metro Tunnel on a painting, which was later, in 1975, depicted on a Soviet stamp. 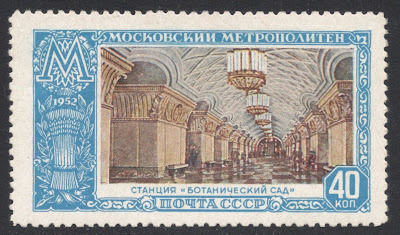 The metro was soon extended, though, and in 1938 another stamp set was issued, marking the extension and depicting various stations. 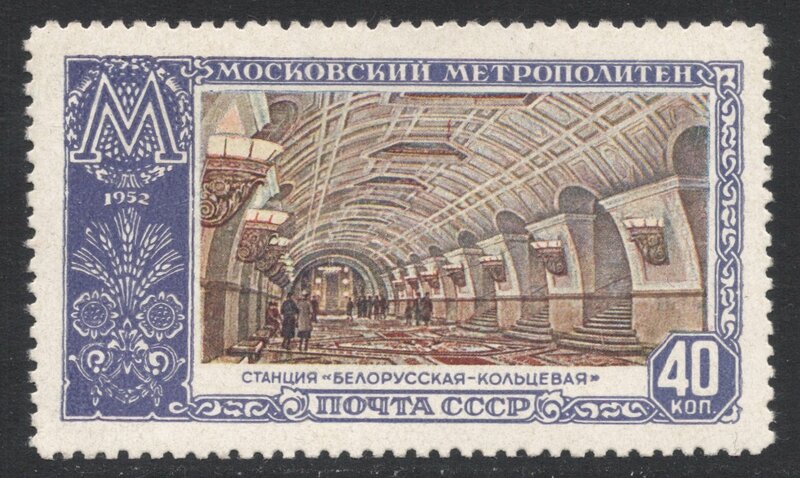 The eventual extensions are shown clearly on this miniature sheet from 2005, to mark the 70th anniversary of the Moscow Metro. The top stamp shows the first single line of 1935, and the bottom stamp the current situation, in a pattern which resembles the so familiar layout of the London Underground. 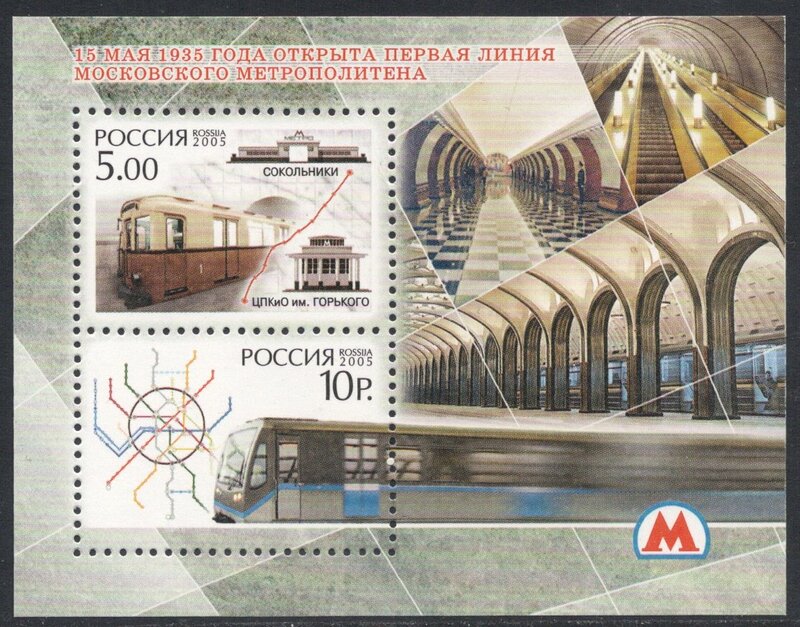 The 75th anniversary of the Moscow Metro, in 2012, was a good opportunity for a number of African countries to issue near-identical miniature sheets. 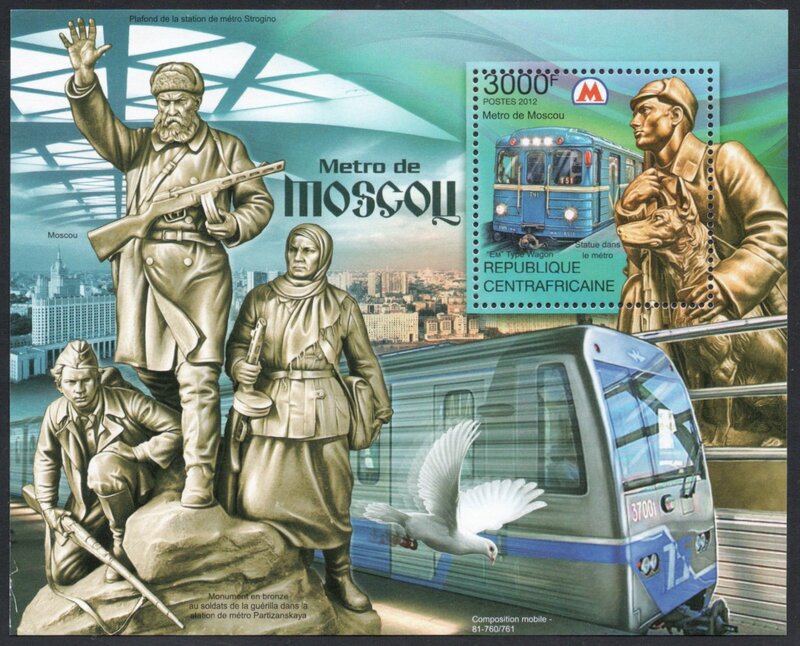 One can have the usual reservations with regard to subject and country of issue, but actually, these are quite good, for they highlight the many bronze statues which you'll find in the stations. Very communist in nature and I'm not sure I'd have liked seeing that group of partisans looming in the dark. Doctor Zhivago associations! So far, most issues shown here are not that remarkable. 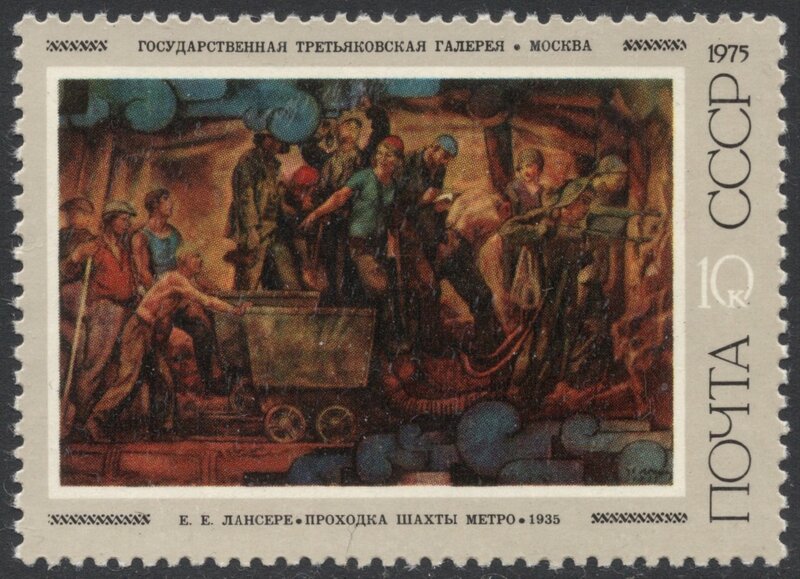 The first Moscow Metro stamps, as were most Russian stamps of the time, are rather dull in colour, with their dark greys, browns and violets. Again, it is the African sheets which hint at the reason why the Moscow Metro is so special. 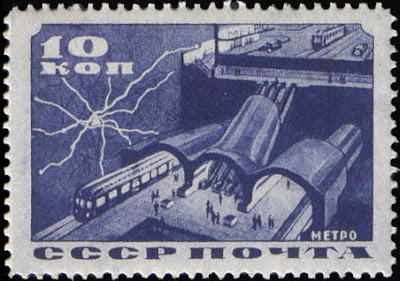 The general idea behind the metro was to create a glorifying monument of the radiant future which the Stalin regime was delivering. 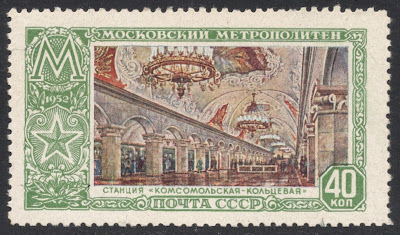 The stations are therefore a pure delight, almost tsarist in beauty and radiance and magnificence, with their high pillars and enormous chandeliers. A true architectural tour de force! 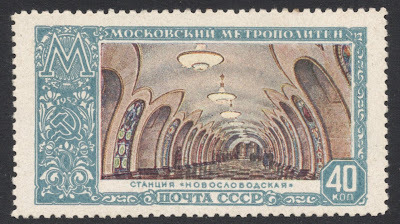 There is only one stamp issue which properly reflects this grandeur, and that is the Russian set from 1952, depicting several of the stations. Enjoy!